Redefining speed and accuracy in non-contact metrology, the Optikos SMI is a high-speed surface topography instrument that characterizes spherical, toric, and aspheric surfaces. 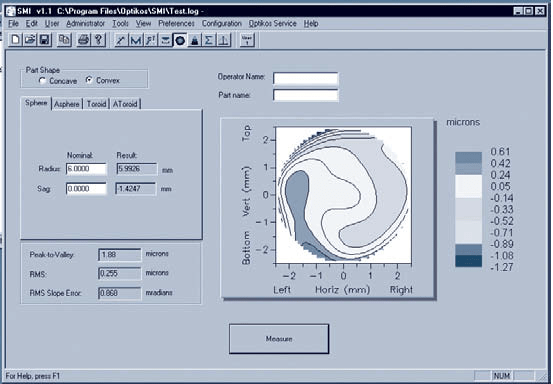 The SMI measures surface shape deviations of precision surfaces using wavefront analysis technology. Configured to measure such items as: micro-optics, ball lenses, and contact lens molds, the instrument allows users to easily measure aspheric and toric parts without the need for reference surfaces. From optics to metal tooling, the SMI measures radius of curvature, toric radii and axis, conic constant and surface irregularities. Full surface maps reveal shape errors to within fractions of a micron. The SMI compares the wavefront reflected from the surface to that expected from a perfect sphere. The surface deviation is expressed in the form of characteristic circular functions called the Zernike polynomials. Within seconds, the SMI can measure shape departures better than 0.1 μm and radius better than 3 μm. Among the many benefits that the SMI provides is its ease of use. The user simply places the part under test on the SMI’s nest, presses a button, and the SMI does the rest. A 2-D or 3-D representation of the surface under test is displayed with numerical results for radius of curvature and conic constants. Included with the SMI software is an OLE programming interface. This allows the SMI to interface directly to manufacturing databases and seamlessly integrate with quality assurance systems. The instrument’s small size takes up little more bench space than a personal computer. Custom fixtures may extend the SMI’s measurement range. Please consult with an Optikos engineer to discover how we can create an SMI to address your special applications. The heart of the SMI is the software package. The SMI operates under Windows® NT and XP® operating system. An OLE interface provides a library of SMI functions that can be accessed by a variety of OLE client applications such as Microsoft® Word® or Excel®, or programs created using tools such as Microsoft® Visual Basic®. Data generated by the SMI can be shared between applications, making the SMI not only a powerful measuring instrument, but also a vital link in any quality control program. Full surface mapping allows rapid evaluation of toric and aspheric surfaces without the need for reference surfaces. A 2-D or 3-D representation of the surface under test is displayed with numerical results for radius of curvature and conic constrants. The set is supplied with certification of surface figure and radius of curvature.